To remove the front door speakers, you will need to remove the door panel first. There are some variations on trim level, but on all you will need to remove the philips screw from the pull-pocket, the philips screw from the inside release handle bezel, and pry the bezel off gently. On certain models you will have a hidden screw at the rear lower half of the door, as well as a corner reflector with a screw behind it. I am including a picture showing all of the possible screw locations, though the last two are not on all models. 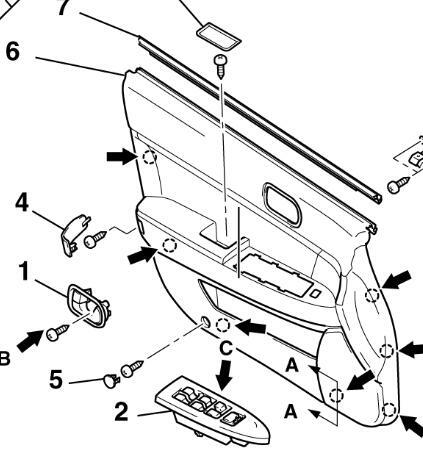 Once the screws are all out, insert a flat edge prying tool from the bottom and "pop" the panel loose; all of the black arrows in the picture are plastic pop-in fasteners. The front tweeters are the easiest to access; check your upper A pillar to see if you have a SRS knockout plate at the top edge. If you do, pry it out and remove the 10mm bolt. Then grasp the top edge of the pillar and pull inward releasing it from the frame, and slide it up and out of the dash. Then grasp the side of the tweeter cover and pull up; plastic pop-in fasteners hold it in place. Then gently pry under the tweeter to release it. The stock speakers vary by year/model but are either 5.25" or 6" speakers. They did have 6x9 in the rear for a short spell, you should not see those in an 07 however. 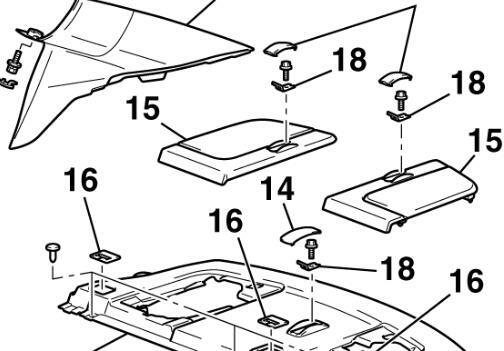 The tweeters are proprietary and you will not be able to find a drop-in replacement for them; they will require custom mounting to go aftermarket.